Large area of low angle rock, around 30m high. The story behind Paradise: In mid 2014 Neil Silverwood and Neil Warrington applied for funding from Sport NZ. Every second year grants are given out to New Zealanders doing innovative adventures around the globe. Perhaps due to a serious lack of applications Sport NZ awarded the pair a grant for route development at Bullock Creek. Warrington and Silverwood had promised to put up 30 routes in 30 days, complete a guide book, and name their first born 'Sport NZ'. 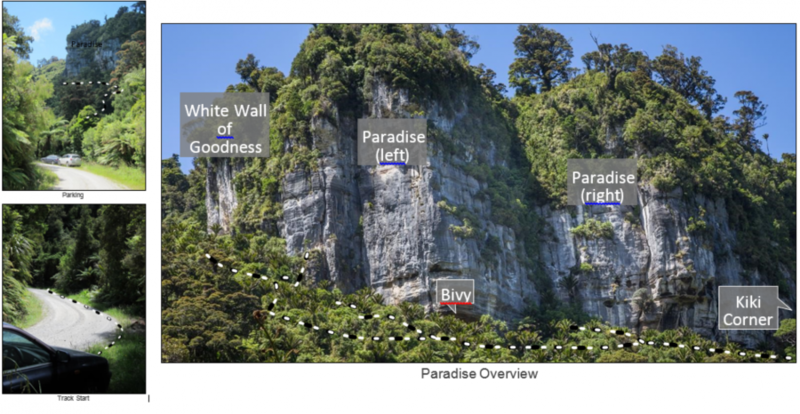 Paradise Bivy was used as advanced base camp and almost all the routes at this crag were created during January 2015. Exhaustion, rain and frustration with living in the dirt slowed progress to a crawl and by half way through the month they only had 10 climbs completed. A post on social media promising free bolts, food and a can of double brown brought in reinforcements in the form of a few more keen route developers. On day 29 of the trip the 30th climb went up. The final tally for the month was 33 new climbs (37 pitches). Park at 1.9km down Bullock Creek Road from SH6 on one of the several grassy parking spots on the right-hand side. Walk 60m further along the road from the last parking spot looking for a marked track leading down to the creek. Cross the creek and follow the trail uphill for 20 minutes before turning upriver underneath the cliffs. Access to the Cuckoo's Nest, is by following the trail to the White Wall of Goodness and turn right after the steep slope. Scramble up a tape handline. Follow the goat trail along, dipping back into the bush occasionally to a spacious bivy cave. The Climbs from " Little Timmy the Guzzberry" to " Just Another Day" are accessed up the grassy slope just left out of the bivy. A delightful number especially if you have a knack for finding hidden holds. Starts just before dropping right into the gully enroute to the Cuckoo's Nest. Starts on the Cuckoo's Nest, as well as "One Flew over the Cuckoo's Nest" & " Chocolate X's" Access by following the trail to the White Wall of Goodness and turn right after the steep slope. Scramble up a tape handline. Starts off the pillar moving left. A naughty little crux leads to some grade 18/19 climbing above, finishing in a fine position on the small arête. The following 7 climbs are accessed up the grassy slope just left out of the bivy. No better way to wake yourself up in the morning. Starts on the right side of the dodgy looking rock. Step right to a bolt, ignoring the instantaneous exposure and storm upwards to the arête and beyond. Finish up via the last 2 bolts of Chocolate X's. Ballerina shoes might be more appropriate for the crux on this climb. Up the slab past some uber delicate moves at the 2nd bolt and then disappear off left behind the tree to the anchor. The fairly well vegetated crack at the highpoint in the gully (the bolts just left of the crack). Bridge up, stepping left gently onto the slab, up past the tree then its time to use your imagination to get back into the crack. Bridge like a starfish all the way to the top. A tricky number that keeps you on your toes right to the top. Start up Meanderthal's crack, clip the bolt on the right wall, and head for the sandy scoop. From here it's pretty self-explanatory, pre-crimp your fingers and follow the bolts. Can be helpful to sling the 4th and 6th bolt. The crack hidden behind the kawakawa trees. Imagine finding a piece of gold whilst out scouring the beach for greenstone. That's how Silverwood must have felt finding this gem. Sustained and terrifying climbing from start to finish, crux hits you at 7m, protected by good cams. A standard rack just cuts it, and a 00 micro cam up top will keep your shorts dry. Recommended for both the quality of climb and for the bonus option of belaying from your sleeping bag. Start on the grass just left of the bivy with rings for its bottom two bolts.